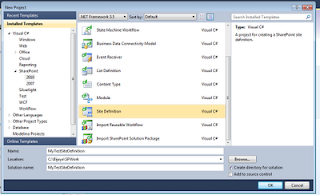 How to create a Site Definition using Visual studio 2010 in SharePoint 2010? In this article we will see What is Site Definition in SharePoint and also will discuss details steps to create a site definition using visual studio 2010 in SharePoint 2010. What is Site Definition in SharePoint 2010? A site definition defines a unique type of Microsoft SharePoint Foundation website according to MSDN. It mainly contains some configurations to make a web site. SharePoint provides various out of box site defination templates like STS which is responsible to make site like Team site, Blank Site, Document workspace. MPS site defination is responsible for creating sites like Basic Meeting Workspace, Blank Meeting Workspace, Decision Meeting Workspace, Social Meeting Workspace, and Multipage Meeting Workspace etc. BLOG site defination is responsible creating sites like Blogs. CENTRALADMIN is responsible creating central administration websites. There are two xml files needed for a site defination. 1. WebTemp*.xml file: This file identifies the site definitions and configurations and provide information about how they appear in the user interface (UI) to users who are creating new websites. And it will found here in %ProgramFiles%\Common Files\Microsoft Shared\web server extensions\14\TEMPLATE\1033\XML directory. 2. Onet.xml files: Define the navigation areas, specify the list definitions available in the UI, specify document templates and their files, define the base types for lists, and define configurations and modules for site definitions. And it will found in %ProgramFiles%\Common Files\Microsoft Shared\web server extensions\14\TEMPLATE\SiteDefinitions\site_type\XML directory. I too had a love story !! !